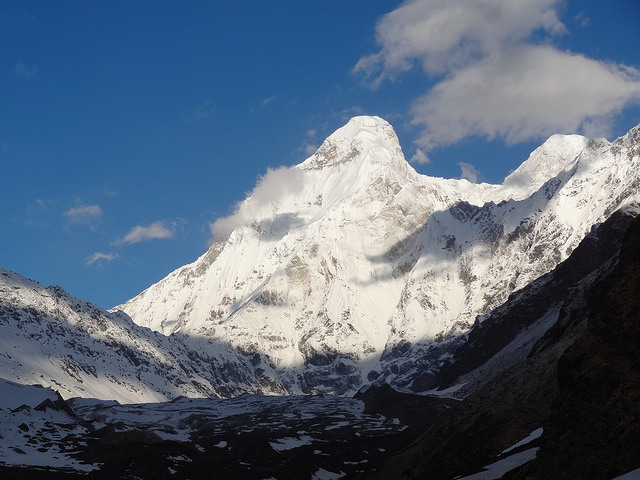 The Nanda Devi area is home to miraculous mountains and its own UNESCO Biosphere Reserve. It remains one the loveliest and remotest areas of the Indian Himalayas. Many trekking options among the massif’s peaks and the ridges and valleys which radiate out from them. The area’s best-known trek is the Curzon Trail. The Nanda Devi area, until fairly recently closed to visitors to protect its biodiversity and still heavily restricted, is home to miraculous mountains (most famously 7,816m) Nanda Devi in its mountain-girt Sanctuary), and its own UNESCO Biosphere Reserve and National Park. It remains one the loveliest and remotest areas of the Indian Himalayas, often called “Himchal” or “snowy mountains”. Ironically, it was long beloved by adventurers of the British Raj, but fell into benign obscurity when Nepal opened up for tourism. 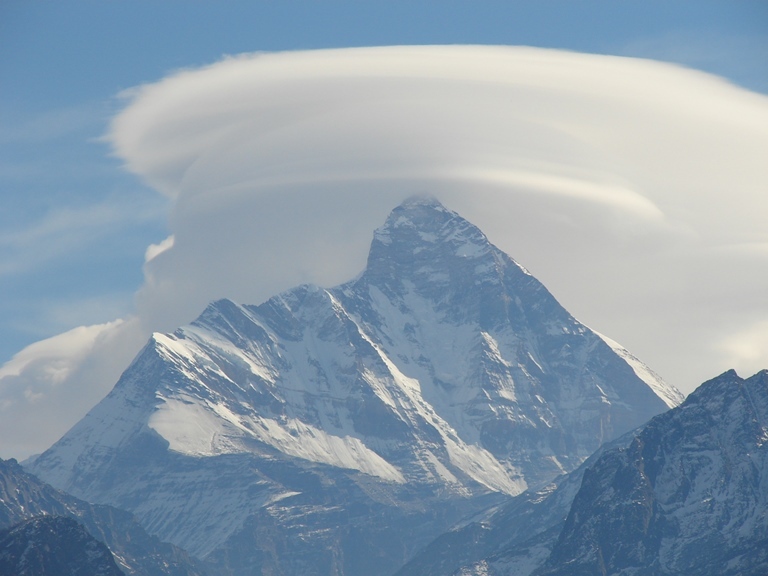 Seen from Tibet to the north, the white-cloaked dome of Nanda Devi dominates all around it. This area lies primarily in the Gharwal Himalayas, but the eastern approaches (eg the Milam Glacier and Nanda Devi East) are in the Kumaon Himalayas and approached from the south-east rather than south-west. Nanda Devi is surrounded by two concentric rings of high ridges and peaks, penetrated by the famously wild Rishi Gorge; within this is the Sanctuary. 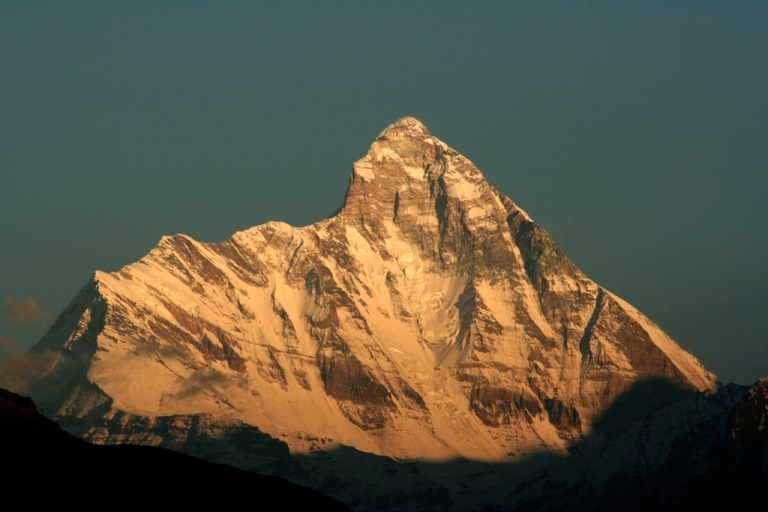 As well as Nanda Devi itself, India’s highest (exclusive) mountain, other peaks in the area include the pyramidic Kamet (at 7,756m) and Dunagiri (7,066m), and Trisul (7,120m). Once you are on the trails, you will find the area wonderfully remote, with old ways preserved and little sign of tourism – very few resthouses, no cafes or even food to buy. The area’s famous biodiversity includes intact ancient forests of peculiar-looking, sometimes almost branchless, dark oaks (a velociraptor could burst out at any moment), [copy in] Wildlife includes various types of monkey; deer and bears; and vultures and eagles and a wade array of delightful, sometimes wildly colourful, small birds. The area has many trekking options among its massif’s peaks and the ridges and valleys which radiate out from it. The area’s best-known trek is the so-called Curzon Trail, named after the famous Viceroy, who walked here in 1905. The trek is relatively moderate altitude-wise – the Kuari Pass isn’t all that high, at 3,658m, after several days’ acclimatization. It winds upward in the “Outer Sanctuary” near the western edge of the reserve, crossing the pass and gaining outstanding views (claimed to be among the best in the world). There are many variants of the route. You can trek around the marvellous outer barriers of the Sanctuary, for instance from Lata over the Dhausari Pass at 4,250m – a tough walk involving big altitude gains, so beware. Trekking to the high meadows at Bedni Bugyal (3,400m - ish) above Wan and east of Ghat, which have huge and stupendous views, in 5 days or so. You can extend this to the Bhogubasa cave and Rup Kund (see below). This can also be an extension to the Curzon Trail. A 7 day trek to the high and mysterious Rup (or Roop) Kund lake at 4,450m. A 4 day trek, along with a throng of Sikh pilgrims in the high season, to the superbly sited Hem Kund lake (at 4,330m), surrounded by seven peaks, and the Bhyundar Valley (Valley of the Flowers), a large and magnificent glacial valley to the north west of the Nanda Devi area with floral life considered to be outstanding even in Himalayan terms – to the extent that it is a National Park. The 6 or more day trail to the huge Pindari Glacier, to the south of the Massif. Very remote, totally unspoilt landscape, superb scenery, views of the lesser Nanda Devi peaks. Another justly famous trek with an ultimate altitude of 3,650m. Milam Glacier and Nanda Devi East Base Camp in the Kumaon Himalaya. Since the closure of the Sanctuary, this is the best way to get close to gorgeous Nanda Devi – and to inspect the huge sea of ice, surrounded by vast (7,000m+) mountains, that is the Milam Glacier. 11-13 Days. www.trekkingindia.com do an exciting-looking expedition here. This can be tough walking in remote mountains with uncertain weather, where altitude can cause real problems. Come fully prepared, including proper acclimatization. A good sign that the area is off the beaten track: Tripadvisor had (in 2015 anyway) few answers to a destination search! Yippee! Please help us by recommending your best walks in the area, making suggestions and sending photos! Thank you!